American football players’ bodies have to be tough, strong machines and they take a beating in each game. Players practice on the field to hone their bodies and minds to be successful, and then they also hone their bodies and minds off the field by watching film or getting in a session at the weight room. A yoga practice is a part of the preparation for many pro-athletes. Yoga can be immensely helpful to improve flexibility, increase joint strength and release built up tensions (physical and emotional), to name a few of its benefits. I asked a few friends who play football at the college level what body part ails them due to their football careers, and the answers were different depending on the specialty of their position on the team. One player said his lower back was always hurting due to the heavy weights used for squats, while another said his hips were perpetually tight. Whether you’re a defensive end or a running back, here are six yoga poses for football players that will be helpful to players on and off the field. Taking all of those hits can misalign your vertebrae. Practicing Downward Facing Dog neutralizes the spine to where it is neither in a forward folded flex, nor a back opening extension. It also takes pressure off of the low spine and decompresses tension between the vertebrae. Downward Facing Dog will also lengthen the hamstrings. Having tight hamstrings make a player more prone to injury. This can be done with any variation of leg position that is comfortable for the player, as long as the spine is elongated while seated. If the spine starts to curve and you are finding yourself falling backwards, then sit up on a bolster or block to tilt the pelvis forward. Spinal twists are helpful in increasing your range of motion. Twists can also help to alleviate low back tension. 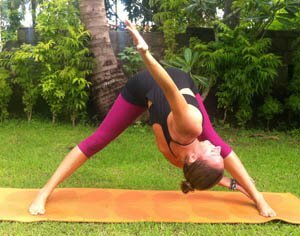 The hip action of Cow-Faced Pose will help to open up the outer hip rotators, while the arm action of Cow-Faced Pose will be amazingly helpful in stretching the deep (internal) workings of the shoulder girdle muscles, tendons and ligaments. Football players typically have more musculature in their arms, back, and shoulders, so be sure to use a strap to modify and get the ultimate shoulder stretch. Tight hips? Lizard Pose works both of the hips in different ways. For your back leg, the hip is getting a deep stretch in a way that extends the front of the hip. The front leg really allows for adductor and deep inner hip and groin stretching. Tip: If you have very tight hips, come into Lizard Pose by using straight long arms, or come down to forearms on top of a block or two blocks once you are able to. Tree Pose builds core strength and improves balance. Close your eyes during Tree Pose to work on the body’s proprioception, or its innate ability to know where the body parts are located without visual cues. Tree Pose is also great to clear and calm the mind. If you are thinking of ten different things, you will find that it is harder to maintain a tall, balanced Tree. If the low back is compressed, tight, and hurting, this pose will help. Keeping the legs at a medium distance, fold from the pelvis, making sure to keep the back long. The most common thing that I see as a teacher is a curve in the thoracic back (behind the lungs) during a Wide-Legged Forward Fold, and we want to avoid that by lengthening the spine first and then folding. Add a chest opening twist by placing one hand on the floor (or on a block) in the center of your stance and twisting the chest in the opposite direction, lifting the alternate arm up to the sky. Adding the twist will open the chest, stretch the shoulders, and help with low backache. Are you a football player who has a chronic problem spot and you’ve been thinking of trying yoga to help? Get together with a bunch of your teammates and hire a yoga teacher to give you a private lesson, go to a local studio class together this weekend, or ask your coach to bring in a yoga teacher and practice yoga as your workout for the day.